This year I am fully immersed in Danish culture. Sarah and I are talking a Danish language course at NYU, we are reading all about Danes in the Xenophobes guide to Denmark, and we are planning our trip to Denmark next year. So, it only naturally feels like our Yule holiday card should be based on a Danish Christmas folklore. The Nisse is a very small gnome-like character who tends to the farm when the farmers are asleep. But he is also very mischievous if you are not kind to him and he will upset your favorite animal or play tricks on you in the night. He is also know to bring the presents on Christmas Eve. In Denmark, this is a very lovable character and most people decorate their trees or houses with his likeness. 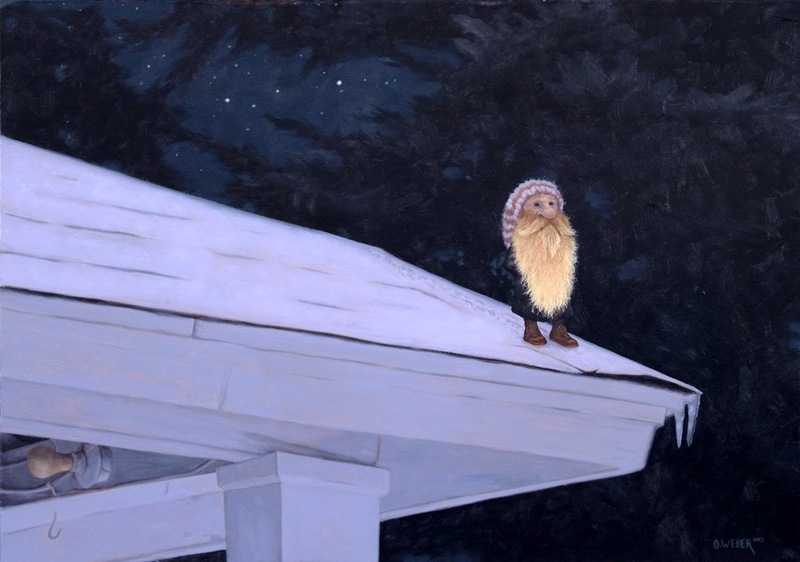 The Nisse, 17" x 12", Oil on Paper on Masonite, 2012.